I’m currently going through an exercise to normalise the spelling of all the place names in my Unst Family Tree – every census seems to invent a different spelling for the same house! At the same time I’m adding a ‘district’ to each house as I’m aware of a number of house names that are not unique within the island of Unst; “Garden” is a house in Colvadale and a house in Snarravoe for example (as I’ve previously written). The absolute need to do this was illustrated to me when I found this particular couple. Above is what you would discover about the couple (from 1881 onwards) using just Ancestry transcriptions. You would be forgiven for thinking that they live in the same house before and after the marriage (spelling variations being what they are), AND that they lived in the same house as each other before they married. If, however, you look at the census pages with the neighbouring houses in context, your understanding of this couples residence would be as follows. So they lived several miles apart before they married, and after being married they lived in the house where Andrew lived, in Muness. The spellings of both houses use both spellings throughout the census returns over the decades. If you then follow this up with the marriage record for this couple, from Scotland’s People, it pulls it altogether, giving their addresses at the time of marriage. I can’t stress enough how important taking all records in their full context and understanding the local area where you are researching. Day 9: Branch out and pick a genealogy website you haven’t used much (perhaps FamilySearch.org, MyHeritage, Findmypast, Access Genealogy, Genealogy Today or Olive Tree Genealogy). Spend at least 15 minutes perusing its offerings. Look for a content listing, how-to articles, resource listings and more. You might discover a new favorite website!. I’m normally an Ancestry girl so I tried out Findmypast with my local genealogy group the other day. They have the same data essentially it would seem, but choose to display it in a different format. For example, for census records, Ancestry shows you one record at a time on the page with the list of other household members at the end, whereas Findmypast shows all rows from that household on the page at the same time (rather like the image shows you). Day 10: Choose a specific problem in your research, such as identifying your great-grandmother’s parents, finding when your second-great-grandfather immigrated, or locating your great-aunt after she was widowed and remarried. Write a plan to research that problem, and list your question, the information you already know, a hypothesis and some records to check. Check out a sample plan. Once I get through all the records I am currently processing, my next problem to work on will be finding all those families that emigrated to New Zealand. I know there are many of them, although some of them I may not yet have even identified as having gone anywhere, they’ll just have disappeared off the face of the planet! This is my basic research strategy. List all those people in my Unst Family Tree that do not have all census records or a death record – suggesting they have disappeared somewhere. For those known to have come to NZ, work through death, and if applicable marriage, records, plus electoral rolls (no census to work with in NZ) to find out more about them. Day 11: Select one kind of record (census record, birth record, marriage certificate, Social Security death index entry, etc.) and ensure you’ve found a record of that type for all your relatives back to a certain generation. If a relative who should have that kind of record doesn’t have one, go find it. Make sure you save a copy of the record, and be sure to cite your sources. Day 12: Select one ancestor and research any of his or her siblings that you know about but haven’t previously studied. This “collateral” research can help you uncover information about your direct-line ancestors, such as parents’ names or birthplaces. Again, this may be one of the reasons why it’s taking me so long to do what I plan, but I do this as a matter of course. It has been extremely useful in locating all sorts of missing people who were later found with their siblings or children. Day 13: Write a paragraph or two that includes everything you know about an ancestor. Writing out that person’s information can help you identify gaps in your research. Janet was born on 27 Apr 1848, the second child of 13, to parents Andrew Scott Edwardson and Barbara nee Sinclair. As with all their children, Andrew and Barbara baptised her within a few months of her birth on 11 Jun 1848. She lived in the family home in Collaster, and then Snarravoe, until she married Laurence Sutherland on 21 Nov 1857 in the Uyeasound Free Church, on the same day as her sister Tamar married. She and Laurence had 13 children and lived in Lerwick and Unst throughout their marriage. She died the year before her husband, on 3 Apr 1936 in Murrister. Day 14: Set a goal that you’ve been holding onto and break it down into smaller parts. By establishing a research plan, you’ll give yourself a guide to future research. For me this is the same thing I described on Day 10, so I won’t repeat it, and catch up another day in my aim to complete this in February. Day 15: Create a checklist of possible records you still need to research for an ancestor. As you work, check off the records you’ve found. Well that’s Week 2 finished, and I feel my tree is in quite good health, albeit still with a lot of work to do, but at least I have a plan! I love it when you find a record and all the names match up, correct parents, spouse, any mentioned children. Tick, tick, tick. All good, it’s definitely them. However, every so often you come across one where it doesn’t fit and you run around in circles looking for the other person with the same name that isn’t them, to whom this record must refer, and end up back where you started with the belief that the record must be wrong. And after all, records are sometimes wrong. It’s like a detective story, where you have to work out who is lying, except (one hopes) the person who recorded the wrong information wasn’t lying deliberately, they just didn’t know (and didn’t realise the frustration their inaccuracies would cause 200 years later!). This evening I have a Thomas Jam(i)eson whose death record shows his parents as William Jamieson and Catherine Christie, and wife Jane Fordyce. The record was informed by his son Thomas, so you start off feeling you can trust the information. Single, Married, or Widowed. When and Where Died. Name, Surname, & Rank or Profession, of Father. Prior to his death Thomas can be found in the census returns along with his wife Jane and their children, and in two of the returns, also his sister Janet lives with them – in 1851 and 1871. I suspect she also lives with them in 1861, but she is recorded as a visitor in another house on the night of the census so that secret is likely lost to the mists of time. When I find his sister Janet’s death record however, I find that she is recorded with different parents to that on her brother’s death record. The informant for Janet is her brother Thomas himself – so I feel this record is more trustworthy than his one. Thomas clearly knows who his own parents are, so is the death record for a Thomas Jamieson actually for someone else? Perhaps there are two Thomas’s and both married someone called Jane and that’s what’s causing the confusion? Dec 2 Thomas Jameson, Stutoft & Jean Fordyce, Greenroad, were married by the Rev James Ingram. James Johnson, Greenroad, William Jameson, Stutoft, Witnesses. This is clearly the same Thomas as on the Death Certificate because in both cases we have his wife’s maiden name. Here we can see that prior to getting married, Thomas lived in Stutoft. If we look at the census which was taken less than 6 months before (1841 census was taken on 6 June 1841) we can see all the people who lived in Stutoft. 1841 census don’t show all the relationships between members of the household (that doesn’t begin until 1851). The pattern I’m used to seeing, from extensive reading of 1841 census taken in Unst, is the Husband and head of household on line one, followed by his wife on line two, and then the children listed either in descending age order, or grouped into boys and then girls and in descending age order within each gender. This record has an odd order. William is listed first, and that is one thing all records agree on – Thomas’s father is called William. There is also a woman, of an appropriate age, called Isabella also living at this house, but she is listed last, like a servant or ‘other’ relation would be. If she had been listed second, that would have sealed it for me, but this record still leaves a small doubt in my mind. Isabella and William Gilbert’s children span birth dates from 1791 (when Isabella was 20) until 1807 (when she was 35). I believe that the younger children on the 1841 census are not her children but in fact her grandchildren (and in one case step-grandchild), and that may account for the odd ordering. Here are William Gilbert Jameson and Isabella Anderson’s children. The green bordered person shows where the death record confusion may have come from. Christie is not a common surname in Unst, and it always pays to have a wider look around when faced with confusion such as this. I see that Thomas’ brother James is married to a Catherine Christie. I have to assume that this is where the confusion came in for Thomas’ son when informing the register of the details for the death record. So I’ve come to the conclusion that the death record is wrong. Whenever I’m in Edinburgh, I make sure I have time to visit the Scotlands People Centre in New Register House on Princes Street in Edinburgh. It’s a location where you can view, on computer, scans of all the records useful for family historians; the Statutory Records, Old Parish Records, Census Returns and many others. Inside the building itself is very library like, it is lined with books (the old registers themselves) and everyone there works away quietly. 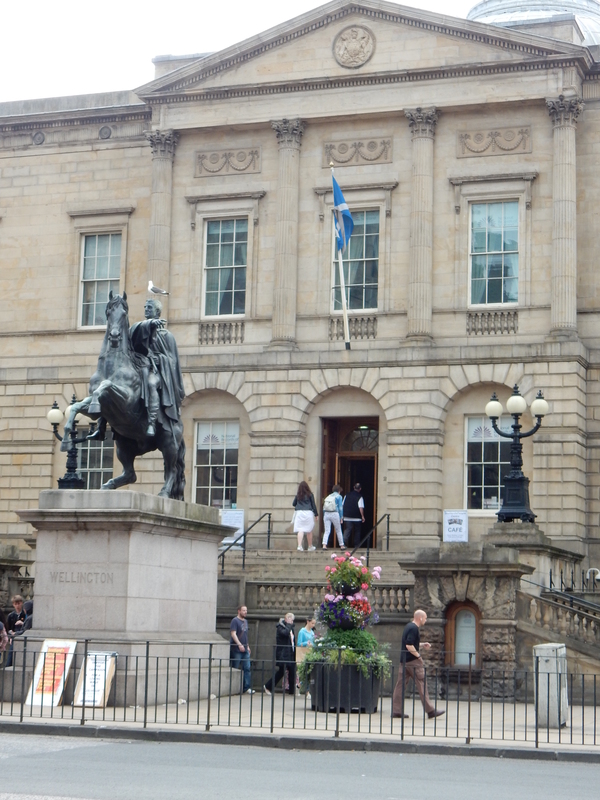 However, the architecture of the building gives another sensation, perhaps one of a place of worship, and certainly it is where Scottish Genealogists come to worship the records of old. It is also a respectful silence, where people are looking for long dead ancestors. These various links have more photos of the inside of the centre. Book lined search room at the ScotlandsPeople Centre in Edinburgh. 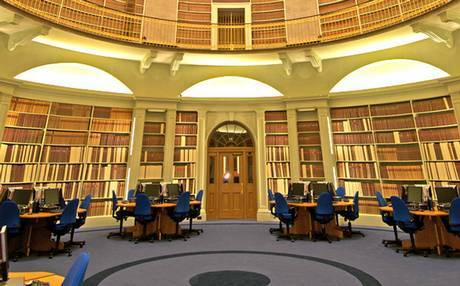 The combination of all these things on your senses; the sight of the old books; the quietness of the sounds around you; and the library smell (old books do have such a wonderful smell) do provide a motivational ambiance which encourages you in your search for ancestors (although the £15 per seat per day may also have a motivational effect!). I do love visiting the place for my ‘old records fix’. I’ve mentioned a few times that I plan to get my Genealogical research onto a website eventually. One of the things I’ve been considering for the design of my website is how to convey the accuracy of the information; after all, genealogical research is fraught with accuracy issues. This is described well in 5 Ways To Tell If Your Genealogy Research Is Accurate. I think there are several types of accuracy I’ll wish to convey about the records I’ll have used. Here are my thoughts on them. I use a range of records, from those I have seen photographs of the original document and made my own transcriptions (5 star) through to facts I’ve been told by other people without any documentary evidence to back it up (1 star). I can imagine a rating scale something like this. ☆☆☆☆☆ I have seen the document, or a photograph of the document that the transcription was made from. ☆☆☆☆ Full transcription provided by someone else without a photograph, e.g. Ancestry website Scottish census records. ☆☆☆ Partial transcription provided by someone else without a photograph, e.g. Ancestry website Scottish Old Parish records. ☆☆ Fact provided from someone else with a note of the record where they found it, but without any transcription. ☆ Fact provided from someone else without any documentary evidence to back it up. There are various ways to look at the accuracy of the recording; the distance in time since the event, e.g. age on a death record; the likelihood of the informant knowing the information, e.g. a neighbour instead of a relative; the kind of record, e.g. a statutory record versus something less formal or rigorous. I can imagine a rating scale something like this. ☆☆☆☆☆ Birth/Marriage/Death date from Statutory record of the same. ☆☆☆☆ Age from Statutory Marriage Record. Parents marriage date on Statutory Birth record of child. ☆☆☆ Age from Statutory Death Record if recorded by a relative. ☆☆ Age from Statutory Death Record if recorded by a neighbour. ☆ Any other record/fact not listed above. There therefore needs to be a formula that conveys the likely accuracy of any one fact recorded for a person, for example if the birthdate comes from a Statutory Birth Record that I have seen the image of, that would be 5-stars on both of the above scales, and therefore the best possible score, however if it doesn’t match all the other records for the same fact, like all the ages on census returns, then that should reduce the score. I suspect I’m going to have some fun trying to come up with said formula! Having given each fact a score, the average of all the scores could be used to convey an overall rating for each person. I suspect these ideas will solidify over time and, especially, when I try to put them into practice when I get to the point of creating my website. I will no doubt find other examples that need rated, and complications to any formula that I come up with. Should be fun though! Looks like the General Register Office (GRO) can take steps to allow access to birth, marriage and death information in England without the need to order expensive certificates, after a change in the law. Complete Unst Tree – How’s it going? A few people have asked me how my project to produce a complete Unst Family Tree is going. It is well over a year now since I created this blog and wrote the initial post about my idea to produce it, perhaps the time is overdue for a little update. A year ago I was amazed to report in that initial post that I had a tree with 5000 people on it. That number has just kept increasing and is now over 8000. I try to make sure when I locate a new person in the records, I follow them, and their family backwards and forwards in time, locating their parents and siblings and following all those people backwards and forwards in time too. This means that whenever I find another record mentioning them, I’ve already done most of the legwork for it. How have I been finding people to add to the tree? I’ve been approaching it from a couple of different angles, if only not to completely bore myself with doing the exact same thing for months at a time! Having started with an ad hoc model that just followed certain branches back through the census (mainly my own family’s branches to start with) I am now being more methodical and working through each entry on each page of the census to make sure I have found everyone. So far I have completed the 1911 and 1901 census returns in this way and I’m about half way through the 1891 census returns. So this approach is working back through time. I’m also working on statutory records, first of all the marriage records, my reasoning being that these records help to pull together people that otherwise you didn’t realise were the same person. For example, you have a wife and her husband in the census, but you don’t know her maiden name, and in another place in the tree you have a child and her parents from an earlier census return and then she just disappears off the face of the planet. Turns out they are the same person when you find the marriage record. I’m processing these records forward in time from 1855 (when statutory records started to be recorded) and I’m up to nearly 1880. Soon (I hope) these two approaches will combine and the processing will get faster because I will have already filled in as much as I can about the person in the next marriage record through already finding them in a census return. At the moment, about half of the records are like that and half throw up new people that I must follow through the records. Once I know I have found all the people who the statutory records (and Old Parish Records which go back even further) and census returns have recorded to have lived in Unst for some part of their lives, then I’m on to the next stage. This is to start applying other documents to the tree, such as almanacs, the Napier Commission interviews, Crofter Commission reports, newspaper stories, and any other documents that mention ordinary people on Unst. These sorts of documents don’t give as much evidence about the specifics of a person, you might get a name and an age, or a name and a place. However, with a complete view of all the people on the island at the time of the document, I have a better chance of identifying exactly the right person without wondering whether it is actually another person of that name being referred to. Sometimes I do wonder whether I have a rather bigger project than I originally envisaged. However, I am still enjoying the process of going through these records and finding the people, so while it is still fun, I will keep on trucking.